The driver MUST be installed "as Administrator"
Run the installer, then after rebooting, plug the USB end of the adapter into one of the USB ports on the computer. 2) Click the plus sign (+) next to "Ports". 3) If the device is properly installed, "Serialio.com USB Serial Port" or "Prolific USB-to-Serial COM Port" will be displayed. 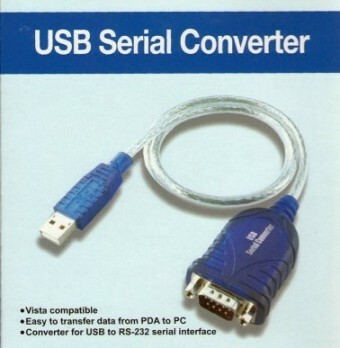 If the USB-RS232 adapter is installed as COM5, it may need to be reassigned to COM1 - COM4 to work with some software. 1) Follow steps 1-3 of "Check the software driver installation" above. 3) Click on the "Port Settings" tab. Click the "Advanced" button. 4) In the "COM Port Number" drop-down select the desired port number. For example if the software requires COM2, select COM2. Note the COM port must have "(in use)" listed next to it, if it does then another device with that name is already installed in the system. After selecting the desire port number, click "OK."
5) Click "OK" again, and the device will show up as being on the same COM port that it was before (i.e., COM5), but should show up on the selected port name when the Device Manager dialog is closed and opened again. 6) Close the Device Manager. Launch the software to use with the new COM port. 1) Follow steps 1 2 of "Check the software driver installation" above. 2) Right-click on the "Prolific USB to Serial Port", then click Properties. 4) Uncheck "Use automatic settings". 5) Select "Input/Output range". Click on "Change Settings". 6) Type "02E8-02EF" in the Value box. This value will change the port to COM 4. If COM 4 is in use, you must choose another port. The values for each port are. 7) Enter the value, then click OK. Click OK again, then click Yes when the "Creating a Forced Configuration" window appears. Click OK.
8) Restart the computer. The Device Manager can be checked, to see the COM port change. Note: Adaptor may not be exactly as pictured above.